Learn everything you can about the test. If your teacher has given you a study guide, great! If not, find out exactly which chapters or concepts you’ll need to know for the exam. If you don’t already know, ask how much time you’ll be given and whether your teacher will be allowing students extra time to finish if they choose to stay longer. It can also be helpful to learn the format of the test; ask your teacher if she will share the test directions with you before test day. Students who are slower workers can study the directions before test day so they don’t need to take time to read them while testing. Devise a study schedule. Sit down with a blank calendar and your study guide and start planning. Figure out exactly which days will be devoted to covering which classes and which specific topics/chapters. Don’t be vague or general - really spell it out. Be sure to plan some “padding” so that your schedule isn't completely thrown off if you need an extra day here or there to cover a topic in more depth. Planning your schedule should be the first step you take outside of class. Do this before you start studying. Give yourself study breaks as you feel your mind starting to get tired. Taking breaks is not a waste of time, but studying when you’re mentally exhausted is. Your brain can’t absorb material when it’s worn out. Give yourself some time to recharge, preferably by moving around – just be sure your break doesn't last more than 10-20 minutes. When you return to hit the books, cover your notes and summarize for yourself everything you learned before your break. Then check your summary against your notes to make sure you didn't forget anything. This will help you get back on track, and will give your memory an extra workout. Test yourself. The biggest mistake we see students make is to read over their notes and believe this prepares them. It doesn't. To be truly ready for a test, you need to practice retrieving the information from your long-term memory. Instead of reading over your notes, cover them and ask yourself questions, answer the questions in your head or on paper, then check your answers against your notes. Flashcards are another great way to test yourself. You could also plan a study session with a friend and take turns quizzing each other. 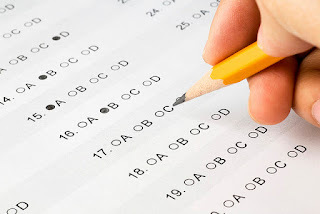 One of our favorite study strategies is to make your own practice test! Make up questions like the ones you predict will be on the test, copying the test format, if you can. Do this about a week before the test. Wait a day or two and take your test without looking at your notes. When you check your answers, you’ll be able to tell what you've learned and what you need to review. You may even want to trade your practice test with a friend for a little extra practice. With these tips in mind, students should be ready to put in the kind of studying that will have them prepared for even the most comprehensive finals! Stay tuned for a future post about test-day tips and test-taking strategies.